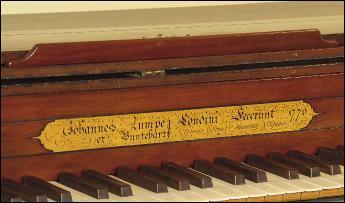 The Five octave keyboard FF-f3 no FF#, with ivory naturals and ebony capped black stained accidentals. Three hand stops: Controlling Buff and divided Dampers at c1. The vertical grained mahogany case inlaid with ebony lines. The lid with ebony line inlay to both sides, with five shaped cast brass hinges. Raised on its Original Trestle Stand with moulded legs. This extremely important early piano has been carefully restored to good playing condition from an unusually well preserved and complete example of this most important maker’s work. 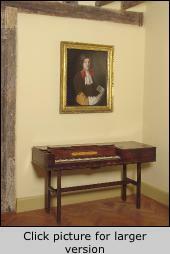 Zumpe’s Square Pianos laid the foundation for the London piano industry and on 2nd June 1768 at the Thatched House, St. James’s; J. C. Bach gave the first ever documented public performance on a solo piano, which was one of Zumpe’s Square Pianos.